On Saturday I met up with some other callers and square dancers to rehearse for our upcoming "Introduction to Contra Dancing w/ Live Music". Our little band boasted a rhythm guitar, an accordeon, a bass accordeon (actually a synthesizer shaped liked an accordeon - a relic from the 60ies with vintage technology, but it sounded fine) and me on the fiddle. Our host - who'll also do the prompting next Saturday - was very satisfied with the results. We played five traditional pieces (Lord of the Dance, Turkey in the Straw, Soldier's Joy, Oh Susanna and Irish Washer Woman) and it was really amazing how fast we jelled into a team - though we had never played together before. In the evening, the host and I played some pieces from my violin teacher's newly released trio album. Even without the second part, the musical result was very exhilarating - and for me it was the first time to perform this with violin and piano instead of hearing two violins. Can't wait for the performance next Saturday. Tuesday and Wednesday I was in Düsseldorf for some business meetings. Flying can actually be fun if one has interesting reading material for the waiting periods at the airport, in transit and while airborne. This time, I choose Gidon Kremer's autobiographic "Zwischen Welten" (Between Worlds). 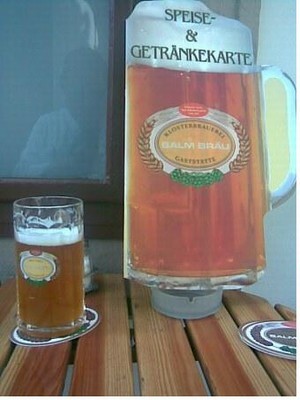 As far as I know, it is only available in German. On top of being one of the best musicians/violinists around, Gidon Kremer is also a very gifted author. "Zwischen Welten" describes his life while studying with David Oistrakh, what it is like to prepare and take part in international competitions as well as his eventual decision to leave the Soviet Union. He also gives us a peek at Gidon Kremer the man, his friends and love interests. Then again, we learn about his projects with several contemporary composers, well-known conductors and other instrumentalists. A very enlightening and entertaining read - I am looking forward to the next installment of his autobiography as much as to his future recordings and concerts. Especially for an amateur violinist, it is very interesting to receive that kind of inside information about a professional's life. The drizzly day began with a wake-up call at 5 am. At the airport the first hint of trouble: the parking garage was undergoing construction and I had to use the newer one, which is farther from the terminal. On my way to the terminal building I got caught in a little rain squall. My frequent flyer card came up blank at the customer self-service terminal (would you believe they originally displayed the beautiful acronym "CUSS" (Customer Self Service, obviously) in hand-size letters?). Usually, I get a little laugh out of the fact that the machine asks me whether I want to go to Vienna or to Vientiane after I enter "VIE" as destination. Instead, the machine sent me to the humans at the check-in counter. There, it turned out that I was proud owner of a one-way ticket from Vienna to Nuremberg even though my itinerary printout stated that I also had a confirmed reservation for a flight there. The humans at the check-in counter sent me on to the humans at the ticket counter. Here I received the amazing news that I would have to buy a one-way ticket to VIE on the spot, at the amazing rate of 603.78 EUR. Wow! Thanks to my trusty little corporate credit card, I could do this and got sent back to the humans at the check-in counter where I received my boarding pass without further ado - it being the middle of the week and with school still out in Bavaria, I even got a seat next to the emergency exit so I could take my legs into the cabin, too. After passing the security check without setting of the metal detector (yay, a success!) 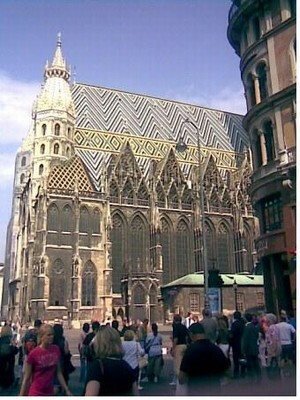 I was informed that the flight would be delayed due to congestion at the Vienna airport. As usual, Austrian Arrows touched down at Schwechat in time - the weather in Vienna was warm and sunny, what Austrians call "Kaiserwetter" (emperor's weather). A 20 minute cab ride final destination in the vicinity of the cemetary of St. Marx, where I still have to visit the grave of Wolfgang Amadeus Mozart. As I got out of the cab, a colleague called to say that he could not make the conference call because of a scheduling conflict and would we please call him before 10:30 or much later. After getting to the meeting room, we decided to call him right now. Afterwards, the meeting went smoothly, all agenda points could be resolved to everybody's satisfaction, the customer will probably extend the contract by at least another year and then we had to finish because my host had to go on to another meeting. On the flight, I had gotten a symbolic breakfast and my colleagues had plied me with coffee and water but by now I was ready for a real meal. 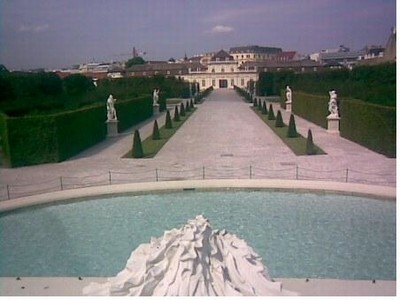 A leisurely stroll in the shade of the tall buildings lining the street brought me to the entrance of the "Untere Belvedere" (Lower Belvedere palace). 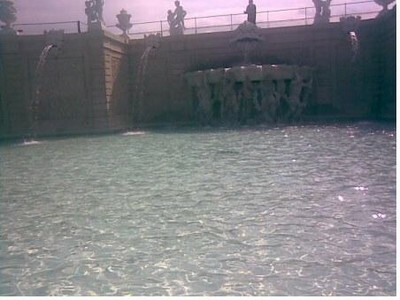 The beautiful fountain was a location frequented by many photographers. The sound of the gushing water made it easier to bear the heat. 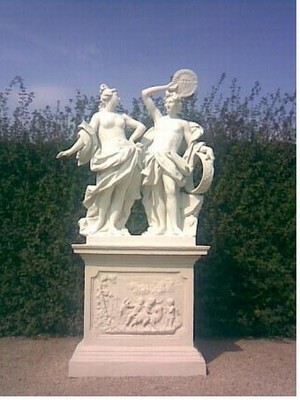 An example of the many beautiful statues decorating the garden. 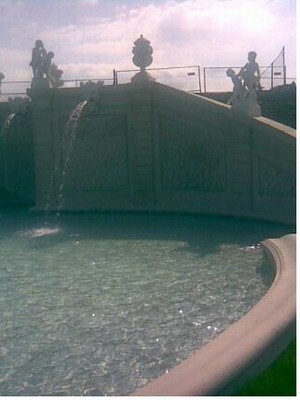 This is the view from the fountain to the Lower Belvedere. By now it was definitely time for a refreshment, so I sat down in the beer garden of the neighboring brewery for beer and a "Fiaker Gulasch" - a traditional Viennese recipe supposedly enjoyed by the drivers of the horse drawn carriages. Further towards the center of the city I hit upon the famous cathedral, lovingly referred to as "Steffl" by the locals. Some steps further I bought panoramic picture postcards - the friendly owner of the little shop also had the stamps and knew the postage rate to Germany. 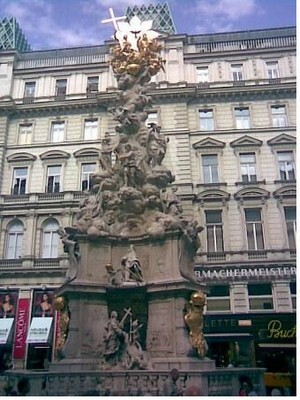 This is the major Viennese shopping district along the "Graben" (literally "ditch") with the famous "Pestsäule". 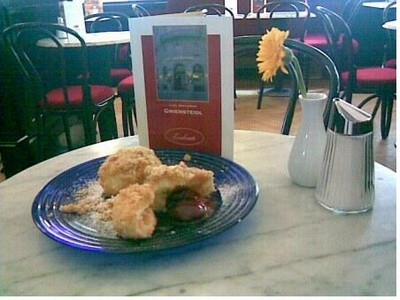 Next to the Hofburg I sat down in the comfortable coffee house Griensteidl for a delicious "Zwetschgenknödel" (plum dumplings). While I waited for them to be prepared and served, I wrote the postcards. Back to culture: passing the "Spanische Hofreitschule" (home of the beautiful Lippizaner horses), I walked to Doblinger's. The used-book section was overcrowded, so I browsed in the current releases and ended up buying two new books, "Zwischen Welten" by Gidon Kremer (mind the blank!) and a new edition of the only Mozart biography by an eyewitness, "Ich kannte Mozart" by Franz Xaver Niemetschek. Then, I took another look in the "used" department, but the sheet music corner was still crowded. The used-book section yielded another jewel, "Gespräche mit Musikern" by Sabine Keck (pictures) and Floria Jannucci (text), containing a score of interviews with conductors, soloists and string quartets. In keeping with the tradition of the day, the flight home was delayed, but again we managed to make up for lost time in the air. Back home in Germany, it had been raining all day. I got my old car from the new parking garage and drove home in the usual 45 minutes. On the radio, the announcer asked after playing a song by Austrian songwriter Peter Cornelius "Have you ever been to Vienna"? Laughingly, I answered "yes"! 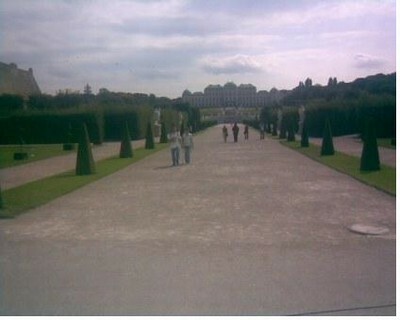 Then he declared that Vienna was worth a trip, to which I could only nod and agree. My wife and our tomcat were delighted to have me back home and the little box of sweets made for a nice present.